You must make reservations at least 5 minutes in advance of the time at 1904 Steak House at River City Casino & Hotel. Casino North Parking Lot. Valet, South Entrance or complimentary garage parking. 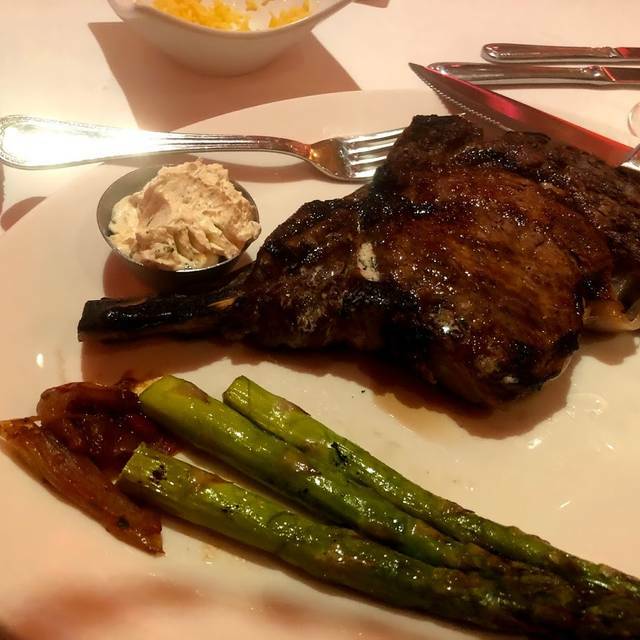 It’s no coincidence that The Best City in St. Louis happens to be home to the best steakhouse in the city—and it’s not just the steaks that are well done. 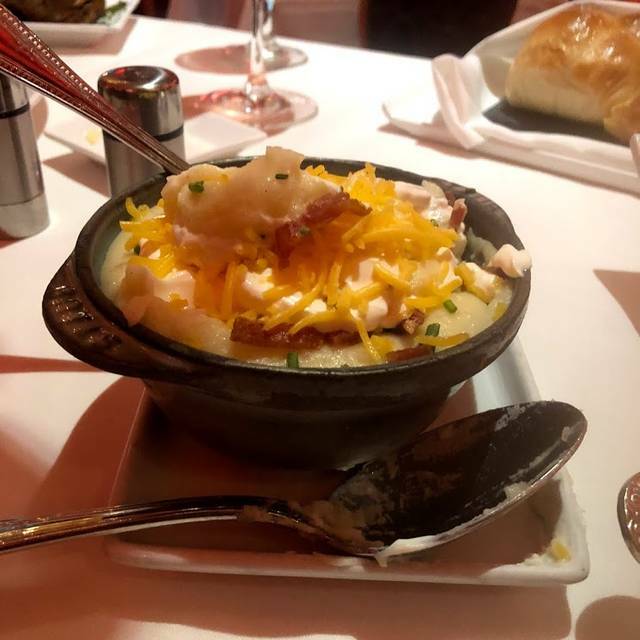 From Seared Skuna Salmon and Lobster Bisque, to Oysters Rockefeller and juicy prime cuts, 1904 Steak House has something to delight every taste bud at an equally tasty price point. Pair your unforgettable meal with one of 120 wines from around the world and drink in the charming surroundings. You’ll soon discover just why 1904 was awarded “Best Ambiance” and “Best Food” by Open Table, the “Award of Excellence” by Wine Spectator, and in 2015, “Best Steak House” and “Best Romantic Restaurant” by Casino Player Magazine. Our server, Jack, went above and beyond to ensure everything was perfect. I ordered the filet and my husband ordered the strip. Both cooked perfectly. Crab cakes appetizer was delicious but small portion size. Still so delicious! Order 2! We got a table next to the kitchen and it was (as expected) louder than other parts of the restaurant that was vacant at the time. The hostess did not offer us a new table. All in all though, great food, great service! We had a very nice experience at the Steak House. Everyone truly enjoyed their meal. Everyone had steaks and they were grilled to our liking. We ordered the lobster macaroni which was delicious. We also ordered the jalapeno cornbread which was fantastic. Our server, Chris, was excellent. Very friendly and efficient. Would definitely recommend this restaurant. Food was great - service prompt - wait staff helpful and courteous!! Jack our waiter was excellent! He knew we had to get to the show, and we had more than enough time, without feeling rushed! Will be back for sure! My filet was not medium rare, it was more medium to well done. The waiter offered to bring another, but we were on a schedule and I told him it was okay. Our server , Chris , was friendly and very attentive. Never had to ask , he always had it before we could. Great steaks, ridiculous baked potato they mixed up for you with butter and sour cream. Love the extra touch! Bread was sooooooooo delicious. The chocolate cake dessert was AMAZING!!!!!!!!!!!! Going back for more! This was one of the best meals that I have ever had out. The scallops were the best ever, and the filet perfection also. I experimented with the beet salad, and was very pleased. Our server and his assistant made it a superior anniversary dining experience. Wait, I forgot the chocolate cheesecake dessert! the sunset menu has several options for a wonderful dinner. The portions are more than I can eat, meaning I get two meals, a plus for me. The waiters and staff are professional and knowledgeable of menu and food prep. Great selection of wines. Went for the twilight dinner special, & it was great, we asked to be seated in a quieter section of the room & was given a booth, far from a fussy baby. I asked for extra anchovies in my Caesar salad & was pleasantly surprised to see that they were able to comply, My coffee was done at the table, French-press style. This was a first for me to have this done. I was just expecting a cup poured at the table. My Manhattan was just fair, but the rest of the dinner was done very well. Wonderful from the time were seated to the cocktails at the bar .. Chris was our waiter and Brandon was our bartender .. We never had to wait for a thing ...the food was excellent.. Awesome! Great place with our friends for my wife and I’s wedding anniversary. Service was outstanding as well as our steaks. Excellent cooked filet. Wonderful portions, and excellent wait staff! Great food and atmosphere. They had the best lobster Mac and Cheese I have ever had. The host/hostess function was slow but our server was excellent. Shout out to Mario who served us well. The food was excellent (8.5/10) and consistent with the price. The casino ambiance leaves something to be desired but that is an expectation. We did not know they would have a set menu for Valentine’s Day. My hubby does not eat seafood and there were two choices for an appetizer. We ordered the scallops....sorry one scallop was on each plate....I ate both. My husband ate my salad and his(very small) we had a choice of four entries with sides. I have food restrictions and couldn’t substitute what the main meal came with. I ordered sea bass that came with about a forth of a cup of purée and about three tablespoons of peas. Dessert was included but it didn’t even look appetizing. My meal was $65 my husbands was )60 for his steak(that had no flavor). Highly disappointing but now we know. The atmosphere was very nice and the food was great we will return some other time.It made are valentine so wonderful.Are server was so pleasant and helpful to us. We went on Valentine's day. They served a limited menu. There were only 4 entrees to choose from. Only one of the choices was steak. A strip steak for $60. I wish u would have known about the limited menu. I would have gone somewhere else. I also think a better choice for a steak would have been nice, since it is a steakhouse and all. Outstanding service, however small issue with my food. I the new york strip, medium rare but it was served almost well done. No big deal, waiter apologized, although it wasn't his fault and returned it to the kitchen. Ironically, a woman at the table next to ours also has an issue with an overdone steak. New steak came out and was perfect, juicy and delicious. Then the chef emerged from kitchen to apologize to the woman about her steak. Funny thing is didn't bother to say anything to me. Anyway, once fixed, the food was awesome. Will definitely be back. I really appreciate that they have a sunset menu to make it more affordable to more people. Same great service and great atmosphere and great food. It was very nice, but there are other places that are better for half the price. We both had the 6 oz filet, one medium and one medium well. Both were cooked perfectly and were delicious. Asparagus was great. I highly recommend the chocolate caramel cheesecake!! Service was excellent as well. The service and food were great. We celebrated two birthdays. The salmon was excellent, my husband had a steak - had a bite too chewy and on the tough side wouldn't order again. The chocolate dessert is awesome I highly recommend it - but huge share it! Excellent food and service by Jack. Will definitely go there again. Ordered a ribeye medium rare and came out barely any pink. Asparagus was under done and charred. Small portions with big price with just average taste. As a new transplant to the area, this was my first time eating at 1904. Overall, I enjoyed the experience and thought the food was delicious. My only complaint is that I feel you shouldn’t have to choose between a vegetable and potatoes when ordering a steak. The plate looked fairly sparse with just a steak and asparagus on it. Both should be standard with a steak which is standard at most other steakhouses. We had a very good meal and enjoyed the facility. We were there on a Casino Comp and so the price didn't freak us out although they are a bit pricey. We also think the Casino was very generous with our comp. We don't drink so it was very hard to spend $150.00 much less $200.00. Meat overdone (they did cheerfully replace). Asparagus no taste. Mario was an amazing waiter, he took great care of us!! The food we ordered was delicious!! Definitely would recommend to family and friends!! Our server did not seem happy. However, the server's assistant was super friendly and seemed happy to serve us. A # 1 Top Notch !! Fillet mignon is to die for you don't even need a knife! The food was good. There was a special for $28 that included dessert so the value for the amount of food was really good. We had great service. This is a nice restaurant for a date. I do not like being told how many letters I MUST use to write a review! The service was slow, things were forgotten, and the place looked dirty. We have dined here before and it was excellent. I don't what happen, but it has gone down hill fast. I would not recommend.